Albrecht Dürer was the first Northern European artist to fully embrace the spirit of the Renaissance. As a young man he travelled to Italy and was directly influenced by Italian art. He also cultivated the attitude of a humanistic scholar and wrote a treatise on geometry. In addition to being a painter, Dürer played an important role in the history of printmaking and his prints were distributed throughout Europe. Originally written by the distinguished humanist Sebastian Brant (1458-1521) in 1494 and published in Basel, the Narrenschiffwas one of the most successful published works of its age. 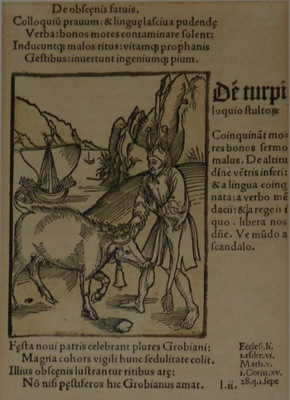 Also known as the Stultifera Navisor Ship of Fools, the work was first published in German, but there was a gradual demand for it to be translated into all the leading European languages of the time. Jacob Locher adapted it into Latin in 1497. It appears that subsequent translations into French and English were based upon this edition. The first Flemish translation was published in 1500 by Guyor Marchand, a Flemish printer living in Paris. Although Marchand’s edition draws on the earlier German editions, for the most part it is based on the Locher translation. Alexander Barclay was responsible for the original English translation, or adaptation, of theShip of Fools,which was first published in 1509.